Learn the core foundations of Pilates. This class is structured for new Pilates students, or those who are interested in refining their movement. You’ll learn the difference between neutral spine and imprint, proper Pilates breathing, ribcage placement, neck placement and pelvic alignment. Mastering these basics to your practice will ensure you perform each exercise properly and have a clear understanding of muscle engagement. You’ll learn to work your body in all planes of movement, and will master the fundamental exercises that you need in order to improve your practice over time. Some exercises you’ll do in this class include single leg stretch, scissors, figure 4 resistive stretching and important prep exercises for teasers, plank, pushups and side plank. 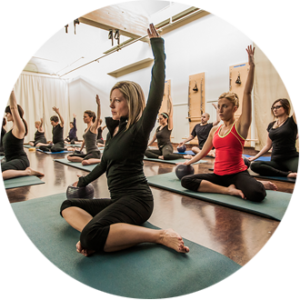 This class will teach you proper biomechanics so that as you grow in your practice you’ll know how to protect your back, use Pilates breathing to intensify each exercise, and how to create opposition in your body. Learn the core foundations of Pilates in an all level class. These classes build core strength and flexibility through exercises originally developed by Joseph Pilates. The breath is used to engage pelvic floor and strengthen abdominal muscles, thus relieving back strain and pressure. Class Pilates is a low impact exercise program that is also especially valuable for clients with foot, knee or hip injuries. This is a full body workout where you will reshape your waistline, contour your legs, and gain a firmer rear. This is an all level class and your instructor will offer both modifications for newer students and up-level challenges for those who want to intensify their workout. If you have mastered the fundamentals of Pilates alignment, breathing and how to focus on engaging specific muscle groups, then it is time for you to move on to become an Intermediate Level Pilates student. At the Intermediate class level you should be able to create opposition in your body, and start adding “up levels” to each exercise to challenge your core strength, mobility and stability. In this class you’ll practice Intermediate exercises such as double leg stretch, 1-legged bridge work, side kicks, push ups, side planks, and back extension. A class that targets sculpting the lower body systematically using the Pilates repertoire. Reshape your waistline, contour your legs, and gain a firmer rear all in one intense mat workout. Be ready to feel a burn! This class is designed for pilates students and athletes who are ready to move beyond the Intermediate class level and want a real mind/body challenge. At the Advanced level you should have a clear understanding of how to engage targeted muscle groups and enough strength, balance and flexibility to work the muscles to the point of fatigue and flow easily from one exercise to the next. The Advanced student has mastered the mind/body connection, and understands how to resist both ways in each exercise. Some exercises you’ll do in this class include corkscrew, open leg rocker, jackknife, control balance and neck pull. We will work on the efficiency of muscles, balance, and focus. Every exercise will work towards fatiguing muscle groups to build endurance. This is a flowing series of slow, methodical, intense exercises to fast dynamic movement. Expect to sweat and be open to try new things. Another popular class is Pilates Rehab, focusing on a gentle range of motion, and working to improve joint stability and spinal rotation. Exercises in the Rehab class avoid thoracic flexion…especially important when working with clients who may suffer from chronic back pain, scoliosis, bulging discs, or are recovering from a recent back injury. Yoga and Pilates are made for each other! Traditional Pilates exercises will be mixed with the deep stretches and strengthening poses from yoga. This class is ideal for those who to stretch and strengthen hamstrings, hips, back and shoulders. This class is designed to be a total body workout firming and toning every major muscle group by combining intermediate pilates exercises with traditional yoga postures and stretches. You’ll get your heart rate up and challenge your core, balance, and full body strength in a vigorous, fast paced class. You will burn fat, while lengthening the muscles for a more lean physique. This workout is the perfect complement to your regular yoga or pilates practice and you will definitely be feeling it the next day!